Top-model Lindsey Wixson bundled up in luxe furs and ornate prints for a fashion spread featured in the December issue of Vogue Japan in 2013. The American model posed for Emma Summerton in a winter wardrobe of layered looks from the likes of Dolce & Gabbana, Duro Olowu and Louis Vuitton styled by fashion editor Giovanna Battagalia. 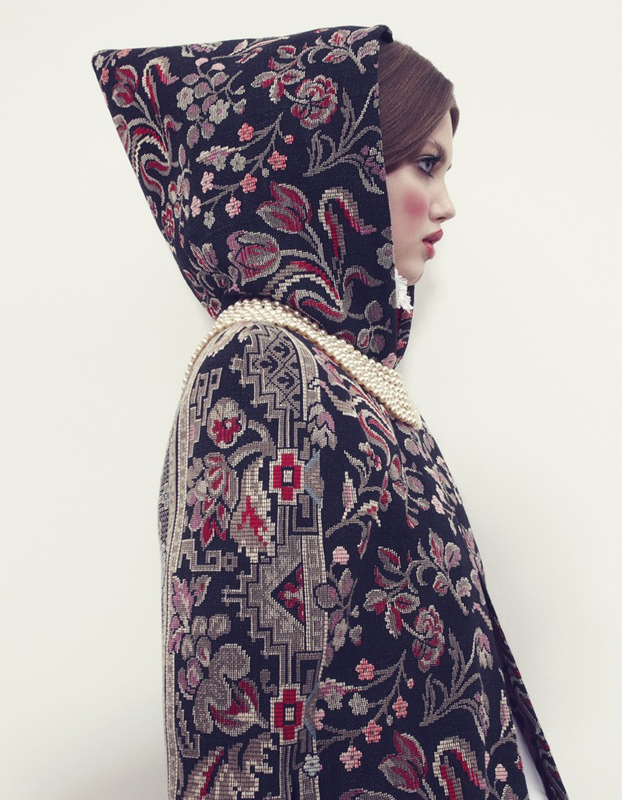 Vogue Japan celebrated Russian culture via Lindsey Wixson’s exploration of winter-kissed landscapes and landmarks. The detailing of each look correlates with the complexity in architecture, and Lindsey herself is reminiscent of the most fashionable Matryoshka doll. Rouged cheeks courtesy of makeup artist Mathias van Hooff and teased hair by Neil Moodie gives Lindsey a doll-like look. La création russe, à la fois populaire et raffinée… merci pour cet article enchanteur qui nous donne à voir du Beau, vraiment féminin, vraiment original. Avec 100 fois moins de moyens que leurs homologues anglo-saxons, les créateurs / designers russes parviennent à les surpasser par une hyper-créativité patiemment renouvelée par la réinterprétation constante de leurs codes traditionnels.